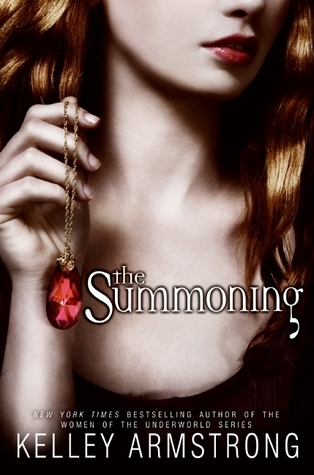 The Summoning (Darkest Powers #1) by Kelley Armstrong, published by HarperCollins in 2008. Official page. Author. Publisher. Goodreads. Amazon. Book Depository. All I wanted was to make friends, meet boys, and keep on being ordinary. I don’t even know what that means anymore. It all started on the day that I saw my first ghost—and the ghost saw me. So … I liked this book. But it begins slowly. Following Chloe through her supposed mental breakdown and subsequent discovery of her powers, I could see and hear her saying things, but at first, I just wasn’t feeling them. I got the descriptions of the events and her emotions, but was left with a sketch only, with little colour and shading, if that makes sense. But then the story started getting interesting. And I flew through it in a matter of hours, and I’ve already gotten the other two parts from the library. So I have high hopes for the rest of the series! And then there are the boys. At first, I automatically began searching for the ubiquitous lovematch, and, failing to find an obvious, strong connection, felt the first stirrings of disappointment. And then I kicked myself – why would all YA have to feature love stories? Truth be said, I think I can sense an unusual one brewing here, but Chloe is 15 years old and has just found out she can communicate with ghosts. So, as she said, getting a boyfriend in a home for troubled teens is the last thing on her mind. In fact, Chloe has a refreshingly down-to-earth opinions about boys and relationships. She complains about the normal social responses to weird boy behaviour: “Why is it that every time a girl says a guy is bothering her, it’s fluffed off with oh, he just likes you, as if that makes it ok?” and actually acts on her own instead of being a damsel in distress: “I still thought they’d come back after things died down. /…/ And maybe that makes me a silly girl who’s watched too many movies where the good guy always comes back to save the day. /…/ That did not, however, mean I was sitting here like an action-flick girlfriend, twiddling my thumbs waiting for rescue. I might be naive, but I wasn’t stupid.” Go Chloe! So yeah, you’ll be hearing more from me about The Awakening and The Reckoning, the remaining two parts of the trilogy. In unrelated news: I got my first mechanical keyboard today and it’s so soft and I could just type forever and I think I’m in love. See my review of parts 2 and 3 of The Darkest Powers trilogy here. This entry was posted in Book Review and tagged 3.5/5, fantasy, paranormal, review, YA on May 21, 2014 by Kaja.